Whether you are a monolithic corporation or a tiny startup, one thing is clear: your business needs social media in order to sustain itself and grow. Social networking has become an invaluable business resource that optimizes company visibility online, boosts your SEO results and allows you to build a relationship with your customers. You know that social media is a great tool for marketing your business, but how do you know that you are getting the most out of it? In order to help you better understand how to get the most out of social networking, we are going to show you how to measure your social media ROI. 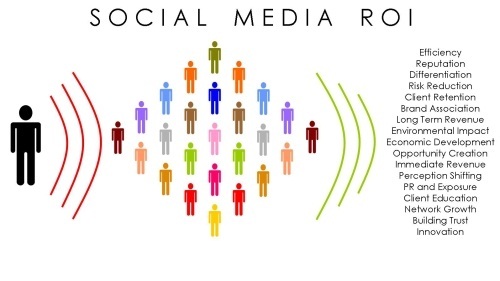 In the world of social media, the word ROI is arbitrary if you do not carefully consider what the return is. This is due to the fact that unlike most business investments, the primary benefits reaped from social networking will not be monetary. In fact, unless your business becomes the next YouTube sensation, you will not be making a dime directly from social media. Social networking is all about creating business opportunities — not an immediate profit — so you need to look elsewhere to determine how Facebook, twitter, Google +, etc. are benefiting your business. Although a successful social media campaign will not involve actual money, they are assets. As assets, they should be evaluated in order to determine their worth to your business. Take a look at the potential monetary value of each like, share, follow, etc. and multiply that by the number you actually have. For example, if you determine that each share is worth 20 cents to your business and you have 100,000 content shares this month, then 100,000 x $0.20 = $20,000. Don’t worry about wracking your brain trying to figure out how much a like is worth to you either; there are many resources out there that can help you accurately derive the monetary value of social media interactions. There are millions — and possibly even billions — of social media interactions that your company will engage in every single week. So there is no way that you can count everything that happens on your social network by hand. In order for everything to be adequately measured, you need to use good metrics tools. There are plenty of free and inexpensive measurement tools out there that can give you hard numbers, changes over time and simple projections. Overspending on PPC social media resources will minimize your ROI from social networking. As such, it is important that you independently compare the cost of your paid investments against the value of your free social media placements. Most PPC placements are all about gaining traffic for your website, so focusing on comparing the free social media placements that create website traffic is the best approach. This will allow you to maximize the traffic from your PPC investment without spending too much. As we mentioned earlier, there is a lot of data that comes with social networking. In order to get the most out of it, your social media campaign must not operate in its own silo. It needs to be a part of a cross-channel internet marketing campaign that allows it to work to bolster the effectiveness of everything else, and vice versa. The only way to get this right is with good marketing automation tools. They will allow you to not only use the vast amounts of data that comes with internet marketing, but they will allow you to accurately measure the ROI of each channel, including social media. This may seem like a large mountain to climb just to get some measurement out of your social media campaigns, but tracking is an important piece in improving and learning from past mistakes and/or successes. You’re not alone; there are plenty of tools and software platforms that can help you along the way. Making the most of your social media campaigns can significantly improve your business in this day and age.